The Manehattan Project Update #27: Introducing Our Latest Artist: Blue Nova! A very happy Thursday to all of you! Novel Idea here with some very exciting news. Last week, we had a couple awesome applicants for artists looking to join The Manehattan Project in the creation of Gardens of Equestria. Well, one of them decided to throw himself into a test project and ended up with lightning-fast results five days earlier than requested! It took me all of about ten seconds to make the call to bring him on board, and that’s eight seconds longer than I needed. Nova, also known as on sites such as DeviantArt by the handle “Droakir“, is a professional freelance illustrator and independent comic artist. 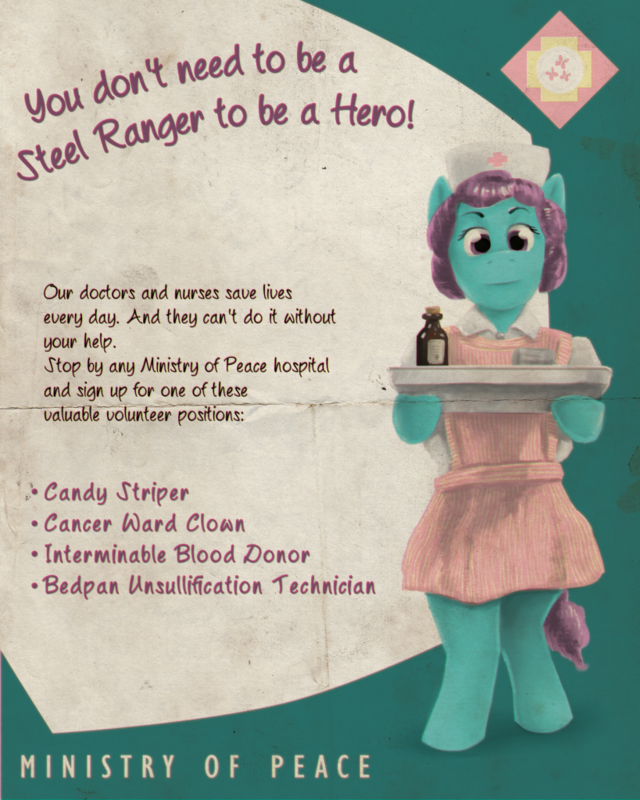 An avid fan of both the MLP and Fallout franchises, it was only natural that eventually he would discover the perfect blend of the two known as Fallout: Equestria. Now he is joining the team and lending his talents to make the rich history of the world come to life in the form of faded billboards, worn out old posters and musty book covers. Nova spends his free time reading, drawing, writing music, tinkering with electronics, and building artificial superintelligences. Now, they say that a picture says a thousand words. Well this one probably rivals Fallout: Equestria’s word count. So today, I’m am ever so happy to reveal our new Ministry of Peace Recruitment Poster for Gardens of Equestria: This Coming Storm and Racing Apotheosis. Based directly on Kkat’s original description from the novel, I like to think this is the most FO:E-accurate poster revealed to date (though I may be a bit biased). All of the work was done in about two days by Blue Nova, including a new custom version of the MoP logo based on Brisineo original logo. We actually have another potential artist in the pipeline too and I’m really looking forward to showing off his work next week! We still have plenty of openings if you want to join the team. The more folks we get, the more we can do! (Well for a lot of things. There’s a few positions that would end up with “too many cooks in the kitchen.) If you’re interested, head on over to our Recruitment Center! That’s it for this week folks! Things are booking along here at The Manehattan Project and we can’t wait to show you what we have in store. Until next week, have fun and stay safe out there! The Manehattan Project Update #26: Welcome to 2016! The Manehattan Project Update #28: Introducing Our Latest Writer: Silver Chord!